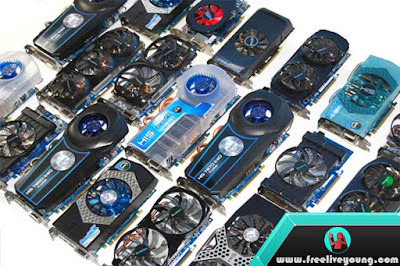 Freeliveyoung.com - Tips for Choosing the Right VGA / Suitable for PC Gaming - For a computer, VGA is one of the most important components needed to run everyday activities, especially for PC / gaming computers.With matching VGA support, you'll be happy to play your favorite games with no problems at all. If likened, GPU on a computer is the processor / brain of a graphic card. So, Graphic card add-on has its own processor so that the performance on the main processor will be lighter. For now, there are 2 suggested GPU platforms for PCs, Nvidia and Ati Radeon. The speed level of a GPU is called Core Speed. So, the bigger the Core Speed of a GPU, the better the performance. Example GTX 550 Core Speed 980 Mhz, Bost Speed (-) Mhz. One of the things that must be considered in buying a VGA is the brand, the more famous brand of a graphic card (VGA), the better the quality of the VGA, one of the VGA brands is quite famous among computer users are Gigabyte and Asus. But for those of you who have a fund that is not too big, you can choose other alternatives such as Zotac brand, the difference is not too far away, just different levels of to-just course, besides its performance is also almost the same. As mentioned earlier in the first point, core speed is the most important thing you should pay attention to, before buying VGA you should pay attention first core speed / maximum Cuda core on its GPU. The better the core speed it will be the better the VGA. In addition to core speed, there is also a bost speed mode. There are usually two types of Core Speed: base mode and boost mode. Examples of MSI Nvidia GeForce GTX 970 graphics card speed, 1241 MHz Boost Mode and Base Mode 1102 MHz. Memory capacity on a VGA varies, for example, 512 Mb, 1 Gb, 2 Gb to 12 Gb. The function of the memory on the VGA is actually almost the same as the RAM function on the computer / PC, so this memory will temporarily store data that has been processed by the GPU and then in the transfer to RAMDAC. Then RAMDAC will convert the digital data to visual data and send the result to be displayed to the monitor via VGA, DVI and HDMI cable. What is memory clock speed? The clock speed memory is the speed of a memory in a graphic card in processing a data. The faster the clock speed than the better the better the performance. But maybe the price will also be higher. Type of Memory Interface used a graphic card will usually be shown with DDR or GDDR code. This type of interface greatly affects the data transfer speed of the processor, motherboard and Graphic Card.The higher the type of interface or DDR then the higher the speed of access. Examples of DDR1, DDR2, DDR3, DDR4, and GDDR5. Currently, the most recent type of GDDR is the GDDR5 type. So it is highly recommended to use GDDR5 interface. The larger the data path, the greater the data that can be accessed. For example 32bit, 64bit, 128bit, 256bit, 512bit, etc. Usually the greater the data path the greater the Memory and Graphic Card interface type. The port on the VGA is a direct VGA port to the monitor. There are 3 types of VGA ports, namely: D-Sub, DVI and HDMI. The newest and most improved Graphic Card ports are HDMI. D-sub is a port that is still used on CRT monitors. while DVI and HDMI ports are commonly used for LCD / LED High Definition monitors. Some of the latest VGA already support more than 1 monitor at once. DirectX is a DirectInput controller (handles input hardware to a computer), DirectSound and directly (handles multiplayer network games). Old games usually still use DirectX 9, but for now, most of the latest VGA already supports the higher DirectX, namely DirectX 10 and DirectX 11. Not all motherboards have 2 PCIe support SLI (Nvidia) and Crossfire (ATI Radeon) at the same time.There is a motherboard that can only support one of them, for example, ASRock H97 Fatality which only supports Crossfire. But if only use 1 piece of VGA Nvidia still can. So read first the motherboard specifications that you will buy if you only use 1 piece VGA just see if the motherboard has PCIe. There are 3 types of PCIe, 1.0, 2.0 and 3.0, with a choice of speeds of 1x, 2x, 4x, 8x and 16x, for now, try to select a motherboard that has PCIe version 3.0 16x. Well, the last is the price of the VGA card itself. You should not be too forced to buy a VGA with high quality if you do not have enough funds, but that does not mean you have to buy the cheapest VGA card as well. It would be nice you adjust to the budget you have before buying a VGA card. A few articles on how to choose VGA / Graphic Card suitable for PC gaming on this post, hopefully, can be a good reference and can help. Thank you for reading Choosing The Right VGA For PC / Gaming Computers. Read too 5 Best VGA For 3D Rendering and Video Editing.